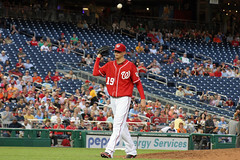 It was no secret going into last nights’s interleague match up that Nationals (21-22) starter Scott Olsen wasn’t quite his usual self, according to Manager Jim Riggleman after the game. Olsen served up four runs in the first three innings to the Orioles, dropping the Nationals’ record below .500 for the first time since April 15 (4-5) and exited the game in the third due to tightness in his left shoulder. While there was no mention by Manager Jim Riggleman regarding whether or not the tightness is a direct result of Olsen’s shoulder surgery last year, Riggleman did say that there was a noticeable difference in the lefty’s throwing during his pre-game bullpen session. A surprise move by Riggleman came in the third inning after taking Olsen out. He sent Livan in to pinch hit before sending in Miguel Batista in to pitch. When asked why pick Livo over another bench player, Riggleman said the decision was made because it was too early to send in one of his other bench players. Fair enough – a trip to the bench players before the fifth is a bit of a downer should you need those bats or arms later in the game. Either way, it was nice to see Livo even if it was only for one at-bat. Batista was sent in with 5.55 ERA to clean up the four run lead by the Birds and held on for what Riggleman called an unbelievable performance. He didn’t allow Baltimore to score a run. But neither did the O’s starting pitcher on the night … until the fourth. The Orioles David Hernandez tossed a quality performance, maximizing on the Nats’ biggest weakness on the night – hitting. They couldn’t hit and they had trouble scoring. Nyjer Morgan, who went in to pinch hit and got a single in the eighth, aided the Nats effort of trying for a late-game come back. Riggleman said it was a good at-bat and hopefully it carries over tomorrow when Morgan returns to his starting role. The Nats biggest chance at scoring runs to catch up to the O’s came with a Willie Harris two-run homer right after Morgan’s hit but there was no shot at any further rallies. Both teams played good baseball, but the Nats fell short leaving the award for the most impressive outing of the evening to the Orioles, who are now 14-29 and have the worst record in all of the MLB. Both clubs played an errorless game. Tonight is game two of interleague play on the 2010 season. Craig Stammen (1-2, 5.86) and the Nationals face Brad Brergesen (3-3, 5.45). Game starts at 4:05. Good Deed of the Day Note: Going either game this weekend? Bring a can of food to benefit the Nationals fifth annual Food Drive for the Capital Area Food Bank. The Nationals ask fans to donate non-perishable food times and paper products. The donation table will be available from the time the gates open until the fourth inning.